Nearly 60 years after the initial declaration of language teachers' knowledge, evidence still seems unsatisfactory as little is generally agreed upon. This study followed Noblit and Hare's meta-ethnography approach to reconcile various researchers' interpretations of language teacher' knowledge through facilitating the accumulation of their substantive interpretations. A total number of 188 studies were chosen through meticulous search techniques and based on CASP quality criteria. The result of the meta-ethnography analysis yielded a reductionist yet inclusive account of language teachers' literacy named Content and Educational Literacy Threshold (CELT) with a two-tire construct taxonomy: Content Literacy consisting of six subthemes and Educational Literacy with four subthemes. Overarching a framework for demonstrating the key findings of the available literature on ELT literacy, the findings of the study can be used by many people in the field including language teaching policy makers, curriculum designers, material developers, teachers and learners and other practitioners. The earlier language teacher's academic preparation was limited to general language proficiency including the perception of language as a system (Roberts, 1998) and the development of declarative knowledge of language (Bailey, Curtis, & Nunan, 2001; Banegas, 2009) with the absence of any particular preparation (Graves, 2008; Lortie, 1975). In late 19th century, increasing emphasis on English as a subject (Widdowson, 2002) diverse from primary conceptualization of English as experienced by native speakers (Banegas, 2009) led to a new movement towards the consideration of the field of ELT as a profession (Loewenberg Ball, Thames, & Phelps, 2008). This was followed by scholars' increasing emphasis on teachers' knowledge as many have endeavored to illuminate the concept that in turn has given rise to its legitimate constituents by shifting attention from "what teachers should know to what they already know and what they actually do when they teach" (Graves, 2008, p. 151). For instance, a discussion paper by Alexander, Rose, and Woodhead (1992) and an Office for Standards in Education's report (1993a, 1993b) are some of the initial attempts to address language teachers' competencies. However, such proposals provoked a storm of criticism that lacked a precise account of the nature of the criteria judging the quality of teaching (Turner-Bisset, 1999). Part of the attempt to respond to such partiality encompasses identifying various dimensions of teachers' knowledge by adapting Shulman's (1986) well-known account of Pedagogical Content Knowledge and Content Knowledge originating from "scholarship content disciplines related to language as a system" (Shulman, 1987, pp. 8-9). However, several potential concerns are easy to diagnose. For instance, Day and Conklin's (1992) modification included a more in-depth qualitative research of 57 prospective teachers. This ended in Content Knowledge, Pedagogic Knowledge, Pedagogic Content Knowledge, and Support Knowledge as the four essential components of any teachers' knowledge domain. However, this taxonomy can hardly reflect apparent consensus on their emphasis on the four groups of knowledge. Additionally, given teachers "use language to teach language" (Freeman, Orzulak, & Morrissey, 2009, p. 77), they are obliged "to use a medium the students do not yet understand" (Wichadee, 2011, p.15) which consequently requires their awareness of the distinction between knowledge of content 1 and content 2; nevertheless, literature has ineffectively exploited the notion of content for various, yet unclear intentions. This competitive equilibrium in researchers' endeavor generated terminological chaos. For instance, "grammatical skills and adequate proficiency level" (e.g., Coniam & Falvey 2002; Elder 2001), 'metalinguistic knowledge base of human language' (Reagan & Osborn, 2002, p. 136), and 'usable knowledge' (Lageman, 2002), have been applied to refer to knowledge of language or content 1. However, as far as 'Knowledge About Language' (Freeman, et al., 2009; Reagan & Osborn, 2002), or content 2 (Freeman et al., 2009) is concerned, 'received knowledge' (Wallace, 1991),'knowledge organized into topic' (Mann, 2005), 'knowledge-in-action' (Schon, 1983, cited in Day, 1993), 'professional knowledge' (Crookes, 2003), "practice of teaching strategies" (Pineda & Núñez, 2001) as well as a series of concept such as phonology, lexical studies, psychology, material design, and so on (Bartels, 2005; Mann, 2005) are utilized to address content 2. Additionally, practical knowledge (Borg, 2003; Golombek, 1998), referring to teachers' awareness of teaching methods, classroom management skills, language planning, lesson planning, and so on, has been the subject of fierce controversies as it has not yet been unanimously exploited in TESOL. As declared by Elbaz (1983), practical knowledge "encompasses firsthand experience of students' learning styles, interests, needs, strengths and difficulties, and a repertoire of instructional techniques and classroom management skills" (p. 5). However, Feiman-Nemser and Floden (1986) believed that practitioner's awareness of their work environments is the pure representation of practical knowledge. Challenging with the disparity, Borg (2003) illuminates a new dimension by assuming practical knowledge as a general framework of teacher cognition which simply covers what language teachers already know, believe, and the way they think. Equally a challenging approach is Day's (1993) adaptation which has been shaped out of a successful amalgam of Day and Conklin's (1992) and Lafayette's (1993) frameworks with theoretical deficiency to claim that experiences allow student-teachers "to develop knowledge as a result of teaching" (Day, 1993, p. 2) without a clear indication of what is knowledge. Further evidence of terminological adaptation with narrow contribution is the addition of intercultural competence by Velez-Rendom (2002) which is also ineffective since the clarity of some issues remained untouched. Andrews (2001) expressed serious concerns regarding such terminological proliferation as it plunges chaos by concealing conceptual similarities potentially existed among those concepts. Nevertheless, a plethora of terminological suggestions would not suffice the evolution of L2 teachers' knowledge base as it requires to move away from the recognition of discrete competencies to a more in-depth sociocultural realization (Fandiño, 2013) in specific circumstances (Freeman & Johnson, 1998) demanding not only epistemological frameworks but "constructing new knowledge and theory through engaging in particular types of activities and processes in specific social contexts" (Richards, 2008, p. 164). Accordingly, a turning point in the teachers' knowledge evolutional processes is the propagation of studies with countless frameworks and models to address language teachers' knowledge (Bartels, 2005; Carter, 1990; Elbaz, 1983; Mann, 2005; Tsui, 2003; Zhang, 2009) with the absence of scientific unanimity. For instance, Professional Knowledge Base (Freeman & Johnson, 1998; Johnson, 1999), Teacher Language Awareness (Andrews, 2001, 2003), and Professional Knowledge (Crookes, 2003) denote teachers' required expertise and are labeled as teachers' knowledge frameworks. Although they employ similar terminologies such as Content Knowledge (Day, 1993; Day & Conklin, 1992; Shulman, 1986), Pedagogic Knowledge, (Day, 1993; Day & Conklin, 1992), General Pedagogical Knowledge (Shulman, 1986), Pedagogical Content Knowledge (Day, 1993; Day & Conklin, 1992; Shulman, 1986; Tsui, 2003), Knowledge of Subject (Andrews, 2001), Language Proficiency, (Lafayette, 1993), Social Context (Freeman & Johnson, 1998), Knowledge of Managing Learning (Tsui, 2003) Technological Knowledge (Zhang, 2009), and many more which had been interminably addressed in related studies, have failed to resolve potential ambiguities in literature regarding their probable components. This undoubtedly has decreased the amount of precision being expected to be seen in a professional career. Table 1 depicts a summary of the given attempts in literature to harness the intricate web of diverse concepts and variables surrounding what has been coined in this study, namely ELT Teachers' Literacy Threshold. Personal Reasoning and Decision Making, Contextual Knowledge. A rich amalgam of Shulman's (1986 & 1987) categorization of teachers knowledge and Dunne and Harvards's (1990) elements’ of teaching. The above-mentioned frameworks have undoubtedly been developed under the general aim of improving teachers' practice, however, they failed to unanimously demonstrate a comprehensive account of language teachers' literacy. In addition to the movement towards a unanimity in the field by proposing a general framework for language teachers' literacy domain, a further motivation for synthesizing the ambivalent literature was associated with the delusion of having a clear-cut boundary between various components of language teachers' knowledge framework (Bennett & Turner-Bisset, 1993) to make up for what Shulman's categorization lacked in his well-known division of teachers' knowledge of content and the pedagogical content knowledge (McEwan & Bull, 1991). Additionally, Shulman's (1986) initial proposition of pedagogical content knowledge which was largely derived from further knowledge domains in different fields of study, was criticized on the grounds of potential ambiguity while addressing teaching knowledge (Marks, 1990; Stones, 1992). According to Shulman (1987) "a major portion of the research agenda for the next decade will be to collect, collate, and interpret the practical knowledge of teachers for the purpose of establishing a case literature and codifying its principles, precedents, and parables" (p. 12), it is then suffice to claim that illuminating language teachers' knowledge base to avoid malfunctioning exposure to a 'decontexualised buzz word' (Stones, 1992, p. 11), necessitates more than a blind adaptation of the initial proposition from other fields of studies. As Loewenberg Ball et al. (2008) argue, without such a research, the ideas of teachers' knowledge, "remain, as they were twenty years ago, promising hypotheses based on logical and ad hoc arguments about the content people think teachers need" (p. 393). Another inherent problem in available knowledge frameworks is the insufficient attention to teacher educators in literature (Borg, 2011; John, 2002) that has misguided researchers to wrongly assume the impulsion of a clear cut boundary between teachers and teacher educators that firmly differentiates their knowledge bases rather than extending (John, 2002) the plethora of studies on teachers' knowledge base (Ben-Peretz, 2011) to the domain of teacher educators. A chronological look indicates that highdegree holders (Wilson, 2006) as well as experienced teachers (Fisher, 2009) have been unfairly labelled as teacher educators. Hence, with regard to the available models of language teachers' knowledge, critics remain dubious on an agreed-upon set of standards to label teacher educators (Murray & Male, 2005). In this study, the required expertise for language teachers and teacher educators are assumed to be situated in a continuum that places ELT teachers' knowledge at one side of the continuum and ELT teacher educators' knowledge at the other side which stems from the initial level of being a teacher. The developmental processes are not only specified to language teachers, but they should be the threshold standards for teacher educators in their professional development processes (Russel & Korthagen, 1995). Motivated to prevent "the danger of randomly offering courses and other instructional activities for accidental reasons" (Day, 1993, p. 2), this study was an attempt to synthesize the current teachers' knowledge frameworks with the indicatives that govern ELT teacher literacy and which have for reasons to be discussed later not been thoroughly considered in knowledge frameworks developed mostly in fields other than ELT. Accordingly, to avoid the fuzzy and debatable application of the inconsistent terminologies, the word literacy is used henceforth. What are the components of an ELT teachers' literacy domain from a synthetic perspective? After an initial explanatory phase with the primary intention of holistically examining researchers' choice in defining and labeling language teachers' literacy frameworks, a conceptual synthesis of ELT teachers' literacy domain was developed with the equivocal results of some inquires obtained through the systematic review of available studies on the definition of ELT teachers' literacy. Consequently, researchers offered a specific and rigid criteria to prevent the inclusion of unrelated studies. For instance, several papers were excluded given they were based on the definition of general literacy or they were illuminating the concept of literacy in other fields. Following Arksey and O'Malley's (2007) methodologically rigorous search technique with strong emphasis on the exploration of all related electronic databases, the systematic review search of the studies across the field of TEFOL, English language teaching and teacher education was conducted. A list of credible journals, namely TESOL Quarterly, Teaching and Teacher Education, Language Awareness, Applied linguistics and language teacher education, Foreign Language Annals, ELT Journal, Teacher Education Quarterly, Modern Language Journal, Language Testing, Language Teaching, Language Learning and Technology, Language and Education, Australian Journal of Language and Literacy, American Educational Research Journal, Journal of Education for Teaching, Journal of the Materials Development Association, Journal of Educational Research, A Colombian Journal for Teachers of English, Educational Technology Research and Development, Journal of curriculum studies, Journal of curriculum and teaching have been thoroughly examined to identify related studies. Moreover, in order to easily cope with the daunting task of dealing with grey literature (Kastner et al., 2012) many discipline related electronic databases including Taylor and Francis, Elsevier, vilely, Wiley, Sage, Oxford, Springer, degrader were thoroughly word searched to locate even unpublished or hard to find studies. Additionally, the search strategy was not limited to examine the design, methods, research questions, and literature, but was supplemented by Peer Review of Electronic Search Strategies Checklist (Sampson, McGowan, Cago, Grimshaw, & Moher, 2009) offering a series of information needed to be used by those who intended to evaluate electronic searching strategy. Finally, despite criticisms (Evans, 2002), a free text search technique (Volmink et al., 2008) with the inclusion of key words was applied as the terminating search strategy to enhance the credibility and comprehensibility of this stage. Although disproportionate amount of time was spent as parts of the systematic review to identify published papers within our interests, the potential research gap was vividly highlighted and the necessity of meta-ethnography analysis was understood. The results of the preliminary search were title-screened by the researchers. Due to the absence of clear accounts of study samples, topics, research design and further related issues in the abstract section, researchers had no choice but scanning through the articles (Evans, 2002; Sandelowski & Barroso, 2003; Shaw, 2004). This problem has also been addressed by others (see for example Evans, 2002; Shaw, 2004). In rare occasions (7 articles) when the researchers were not absolutely sure about the relevance of some articles to the primary goal of the research, two further experts were asked to read the papers and made the ultimate decisions. All inclusion decisions were finalized under the supervision and agreement of the team researcher in a period of five months. After identifying similar topics, researchers had to decide which papers were topically related enough to be included for the final examination. There has been primarily two approaches for the inclusion decision. One approach, systematic review of trials, which is similar to qualitative analysis (Sandelowski & Barroso, 2003) requests researchers to locate all related studies while the second approach advocates a theoretical sampling. However, this later sampling was highly criticized (Dixon-Woods, Agarwal, Jones, Young, & Sutton, 2005) on the grounds of selecting the population of studies from which a sample can be drawn without listing potential related studies. In the selection process, some papers were eliminated solely by scanning the titles due to their relative irrelevancy to the researchers' current interests. In line with Sandelowski and Barroso's (2003) claim, many unrelated studies were also filtered through reading their abstracts. However, relying only on the abstracts might improve the possibility of neglecting some worthy papers due to their poor structures (Evans, 2002; Shaw, 2004). The study also chose to focus on those qualitative findings that informed the construct definition of ELT teachers' literacy, and limited the inclusion criteria to papers that vividly addressed teachers' literacy in other fields or studies. Although we were aware that extracting these papers from our work might results in overlooking some papers, we made such a choice intentionally in order to deeply examine the highly related studies. Hence, to ensure the inclusion of all considerably related works, a number of 231 abstracts were meticulously reviewed and 35 were subsequently excluded due to the absence of associations with language teaching, meta-synthesis, and other related concerns. This resulted a final number of 196 studied for further examination in the quality criteria phase of the study. Bearing in mind the innumeracy towards the conceptualization of the good as a quality criteria, researchers either have applied available criteria so widely that can be applicable to any potential type of synthesis or they have wrongly used one set instead of the others. One formidable challenge to apply such assessment is examining the value of written report instead of research method (Volmink et al., 2008). A further challenge was attributed to the lack of a methodological clarity even among the qualitative studies. The study adopted the questions developed by the Critical Appraisal Skills Program (Atkins et al., 2008) to assess the quality of meta-ethnography research. A total number of 196 articles were evaluated on the basis of CASP questions and 8 were removed. Based on the results of the search review as well as the quality appraisal phase about 20% of the initiated pool (231) were eliminated either for irrelevancy or other related concerns ending in 188 articles. Accordingly, a total number of 188 papers were meticulously read, summarized and reported on all aspects such as method, research questions, data collection, procedure and analysis, quality, ethical consideration, reference list, appendices, and tables and figures by a group of experts. The main themes were derived not only from the results of the studies expressed by authors but also from verbatim text of participants in case they were accessible. In what follows, the results are presented and discussed at length. In the preliminary attempt of transforming results into a conceptual model, a taxonomy was created encompassing two components: Content Literacy (CL) and Educational Literacy or EL (Table 1). Content Literacy included six main themes namely, 1. Conceptual and Theoretical Literacy with four subthemes namely L1, L2, and Ln Grammar , First and Second Language Acquisition Theories, Teaching Approaches, Methods and Principles Literacy, and Interdisciplinary Theories Literacies, 2. Classroom Context Literacy with two subthemes, namely Physical Context Literacy and Sociocultural Context Literacy, 3. Curriculum and Material Development Literacy with three subthemes namely Curricular Literacy, Syllabus Design literacy, and Material Development Literacy, 4. Human Resources Literacy with two subthemes namely Teacher Literacy and Learner Literacy, 5. Evaluation, Assessment and Research Literacy with two subthemes namely Research Literacy and Evaluation and Assessment Literacy and finally 6. Educational Technology Literacy with two subthemes namely Web 2 Tools and Web 3 Tools. The other main literacy construct was Educational Literacy which also included four main themes; 1. Teaching Skills and Strategies with two subthemes namely Language Proficiency Skills and Pedagogical and Facilitators Skills and strategies, 2. Learner Treatment Skills with two subthemes, namely Academic Treatment Skills and Nonacademic Treatment Skills, 3. Management and Leadership with three subthemes namely Class Management, Course Management, and Time Management and finally 4. Educational Technology Use Literacy with two subthemes namely Technologically Integrated Teaching and Computer Assisted Language Testing and Teaching Literacy (CALT). The results of the thematic analysis is shown in Table 2. According to the discussions of post method pedagogy (Kumaravadivelu, 2006) teachers are assumed to fulfill a multidimensional and creative role. Accordingly, it currently seems to be quite obligatory to consider the former stockholders' opinion of what exactly is meant by language teachers' literacy package.Although the indication of labeling stakeholder as expert is not such an easy task (Richards & Rodgers, 2001), the importance of experts' opinion has been previously emphasized by Richards (1991) when reporting what stakeholders assumed about a subject is actually valuable sources of information. Accordingly, to assess the validity of the proposed framework i.e. Content Educational Literacy Threshold (CELT) a group of 50 stake holders and experts were interviewed to elicit their opinions regarding the collected scales and subscales of teachers' literacy within an introspective analysis framework. According to Table 3, all 24 subthemes met the criteria (are higher than +3.0) and are accordingly valid indicators of language teachers' literacy framework. The aim of this study was to examine the components of an ELT teachers' literacy domain. To this end, an ethnography method was applied on 188 research articles related to the definition of ELT teacher literacy. Due to the multifaceted and complex nature of the topic (Chick, Baker, Pham, & Cheng, 2006; Fennema & Franke, 1992; Shulman, 1976), there were abundant indications of L2 teachers' knowledge models and the first task was to collate what was currently being referred to as teachers' literacy. The result of the given meta-ethnography yielded a reductionist yet inclusive account of language teachers' literacy including a two-tire construct taxonomy with Content and Educational literacies as the main themes and 24 subthemes as depicted in Table 2. The first component was largely based on teachers' theoretical understanding which has been either neglected or marginally handled in the literature. There is a growing tendency towards assuming the structure of the target language to be derived as a potent force prior to the existence of any other subject when intending to effectively teach a language (Andrews, 2007; Myhill, 2005). In this situation, the traditional notion of grammar language analysis (Day, 1993; Day & Conklin, 1992; Lafayette, 1993) is replaced by its rhetorical power in expressing meaning (Lefstein, 2009; Myhill, 2005, 2011). Nevertheless, the results of the current synthesis highlighted negligence towards the adequate attention to grammatical literacy. For instance, Mackey (1950) in his groundbreaking article addressed the lack of a systematic reference to such grammatical knowledge which even after half a decade was iterated by De Jong and Harper (2005) who expressed concerns towards inadequate teachers' familiarity with structural knowledge of language which in turn ended in a scarce body of research on the connection between teachers' linguistic knowledge and their practice (Bigelow & Ranney, 2005; Jones & Chen, 2012). Accordingly, several compensating strategies can be found for the inclusion of grammatical competence. For instance, Flynn and Gulikers (2001) believed teacher education programs are required to include courses in both applied linguistics and curriculum design, and all prospective teachers are required to attend a course in practicum. Only under such circumstances they would demonstrate teaching abilities in various contexts. Additionally, Educational Literacy as the second component of language teachers' literacy framework, demands teachers' practical capability. Despite the importance of Educational Literacy (see for example, Day, 199; Day & Conklin, 1992; Freeman & Johnson, 1998; Lafayette, 1993; Richards, 1998; Shulman, 1986; Zhang, 2009), it has sparked controversies due to its fuzzy nature due and inadequate exemplifications (Turner-Bisset, 2001) as the great majority of teaching strategies are context-specific. Hence, there seems to exist several different accounts of Educational Literacy as it is a multifaceted concept which is affected by many factors (Black & Wiliam, 1998; Loveless, 2002; McNamara, 1991). For some scholars, Education is seen as "any conscious activity by one person designed to enhance the learning of another" (Watkins & Mortimer, 1999, p. 3) though others perceive it as the action of teaching encompassing any necessary decision (Alexander, 2003). This uncertainly was resolved as the study defined Educational Literacy by illuminating its main themes and corresponding subthemes. Several implications are generated by this categorization that can in turn contribute to the field. First, the current language teachers' literacy is an overarching framework demonstrating the key findings of the available literature and serving as a means to expedite teacher literacy growth and can be considered as a response to those who expressed concerns over a lack of research on "the knowledge base of teachers" (Meijer Verloop, & Beijard, 2001, p. 60). Hence, The current study was not only a response to resolve ambiguities of the existence of terminological proliferation expressed by Andrews (2001), but to exemplify the subcategories of language teachers' literacy domain as earlier studies failed to sufficiently address the division of teachers' literacy components (McEwan & Bull, 1991). Second, the past studies related to teachers' competency have usually failed to adequately focus on quality criteria as a major concern in qualitative studies which in turn has led to studies without trustworthy results. This problem was exclusively dealt with in this study as a meticulous quality criteria approach was adopted to assemble related studies for the synthetic exploration. Third, beyond the traditionally acknowledged perception of teachers' academic preparation, the current model was likely to be shaped out of an evolutionary account of teachers' expertise which can contribute much to a sense of unity. As explained earlier in the introduction section the earlier studies have failed to demonstrate a scientific unity either due to the monotonic nature of their studies which have focused on individual aspects of teachers' knowledge or have failed to collate the results of the other studies. Having this in mind, the current study attempted to enhance the precision of the identified components addressing language teachers' literacy in order to facilitate the processes of training educated and qualified teachers who not only are aware of how to teach but how to be evaluated. Moreover, providing definitions for different aspects of the teachers' knowledge sheds light on what effective teacher education courses entail. This can definitely assist English language teachers to learn, involve, adopt, and use their knowledge in their teaching. Moreover, despite the earlier frameworks which have failed to resemble adequate wisdom for other experts in the field, the findings of the study can be useful for a varied number of experts including researchers, teacher educators, policy makers in designing and revamping the curriculum for teacher education to train teachers who can effectively integrate such constructs into their teaching. In addition, this study might provide practical significance for preservice, in-service, and, experienced teachers. From a practical perspective, this study has the potential to make preservice teachers to voluntarily follow theoretical and technological changes. This study will also provide contribution to education in general and to the field of ELT in particular. Based on the result of thestudy, it is possible to do some modifications in some area of education such as curriculum. Preparing scholars to apply a theoretical and technology-rich curriculum can provide benefits for not only teachers but students as well. Fourth, to make up for the lack of insufficient attention to teacher educators (Borg, 2011; John, 2002; Murry & Male, 2005) which has deluded researchers to assume a division between teacher and teacher educators' capability, the present synthesis analysis attempted to address such a defect by assuming a continuum with teachers in one side and teacher educators in the other end (Khani & Hajizadeh, 2016) and provides opportunities for teacher educators to experience developments (Russel & Korthagen, 1995). Finally, In contrast to earlier studies, the current synthetic analysis does not limit teacher and teacher educators' literacy to a series of prescribed knowledge. Instead, it is an attempt to situate them on a continuum, in that at one end, novice teachers are standing and as they move forward by gaining experience and wisdom, they gradually go to the other end of the continuum assuming the teacher educators position.Bearing in mind the paucity of individual theories to fulfill optimal success in teaching (Brown, 2000), the current taxonomy does not necessarily need to be ended as it encompasses any potential L1 or L2 theories that teachers might face while following evolutionary movement in the continuum. Hence, there is a need to consider an open ended taxonomy for language teacher and teacher educators’ knowledge denoting the possibility of teachers' access to further theories and concepts which may or may have not been studied before. Furthermore, the study addressed the extrapolation problems inherited in the earlier models of language teachers' knowledge such as TPACK which was originally designed for the fields other than ELT and often without questioning its adequacy (Hwee, Koh, & Tsai, 2010). Many researchers have narrowly adapted the original version of the TPACK scale on the bases of terminologies and have applied it to examine English language teachers' knowledge. The serious concern here is attributed to the diverse nature of knowledge components in the field of English language teaching compared to other fields. And given the domain of language teachers' expertise are defined, in response to the lack of a precise measurement scale (Freeman et al. 2009), language teachers' assessment tools can be developed to easily establish a connection between language teachers' literacy and students' progress (Loewenberg Ball et al., 2008). Alexander, R., Rose, J., & Woodhead, C. (1992). Curriculum organisation and classroom practice in primary schools. A Discussion Paper (London, DES/HMSO). Andrews, S. (2001). The language awareness of the L2 teacher: Its impact upon pedagogical practice. Language Awareness, 10, 75–90. Andrews, S. (2003). Teacher language awareness and the professional knowledge base of the L2 teacher. Language Awareness, 12(2), 81–95. Arksey, H. & O'Malley, L. (2007). Scoping studies: Towards a methodological framework. International Journal of Social Research Methodology, 8(1), 19-32. Atkins, S., Lewin, S., Smith, H., Engel, M., Fretheim, A., & Volmink, J. (2008). Conducting a meta-ethnography of qualitative literature: lessons learnt. BMC Medical Research Methodology, 8, 21–31. Bailey, K., Curtis, A., & Nunan, D. (2001). Pursuing professional development. London: Heinle and Heinle. Banegas, D. L. (2009). Content knowledge in teacher education: Where professionalization lies. English Language Teacher Education and Development, 12, 44-51. Bartels, N. (Ed.). (2005). Applied linguistics and language teacher education. New York: Springer. Bennett, N. & Turner-Bisset, R. (1993). Case studies in learning to teach. In N. Bennett & C. Carre (Eds. ), Learning to Teach (pp. 165-190). London: Routledge. Ben-Peretz, M. (2011). Teacher knowledge: What is it? How do we uncover it? What are its implications for schooling? Teaching and Teacher Education, 27, 3-9. Bigelow, M., & Ranney, S. (2005). Preservice ESL teachers' knowledge about language and its transfer to lesson planning. In N. Bartles (Ed. ), Applied Linguistics and Language Teacher Education. (pp. 179–200). New York: Springer. Black, P., & Wiliam, D. (1998). Assessment and classroom learning. Assessment in Education: Principles, Policy, and Practice, 5(1), 7–73. Bondas, T., & Hall, E. O. C. (2007). Challenges in approaching meta-synthesis research. Qualitative Health Research, 17(1), 113–121. Borg, S. (2003). Teacher cognition in language teaching: A review of research on what language teachers think, know, believe, and do. Language Teaching, 36(2), 81-109. Borg, S. (2011). The impact of in-service teacher education on language teachers' beliefs. System, 39, 370– 380. Britten, N., Campbell, R., Pope, C., Donovan, J., Morgan, M., Pill, R. (2002). Using meta ethnography to synthesise qualitative research: a worked example. Journal of Health Serv Res Policy, 7, 209-215. Brown, H. D. (2000). New vistas: Book 3. White Plains, NY: Pearson Education. Carter, K. (1990). Teachers' knowledge and learning to teach. Teachers' knowledge and learning to teach. In R. W. Houston (Ed. ), Handbook of research on teacher education (pp. 292-310). New York: Macmillan. Chai, C. S., Koh, J. H. L., & Tsai, C. C. (2010). Facilitating preservice teachers' development of technological, pedagogical, and content knowledge (TPACK). Journal of Educational Technology & Society, 13(4), 63–73. Chick, H., Baker, M., Pham, T., & Cheng, H. (2006). Aspects of teachers' pedagogical content knowledge for decimals. PME30 (2), 297-304. Coniam, D., Falvey, P. (2002) Selecting models and setting standards for teachers of English in Hong Kong. Journal of Asian Pacific Communication, 12(1), 13–37. Crookes, G. (2003). A practicum in TESOL: professional development through teaching practice. Cambridge, UK: Cambridge University Press. Day, R. R., & Conklin, G. (1992). The knowledge base in ESL/EFL teacher education. Paper presented at the 1992 TESOL Conference, Vancouver, Canada. De Jong, E. J., & Harper, C. A. (2005). Preparing mainstream teachers for English language learners: Is being a good teacher good enough? Teacher Education Quarterly, 32(2), 101–24. Dixon-Woods, M., Agarwal, S., Jones, D., Young, B. & Sutton, A. (2005), 'Synthesising qualitative and quantitative evidence: a review of possible methods'. Journal of Health Services Research and Policy, 10(1), 45–53. Dunne, R., & Harvard, G. (1990). Teaching practice criteria. Mimeo: University of Exeter. Elbaz, F. (1983). Teacher thinking: A study of practical knowledge. New York: Nichols. Edwards, E., & Burns, A. (2016). Language teacher action research: Achieving sustainability. ELT Journal, 70, 6–15. Elder, C. (2001). Assessing the language proficiency of teachers: are there any border controls? Language Testing, 18(2), 149–70. Evans, D. (2002). Database searches for qualitative research. Journal of the Medical Library Association, 90(3), 290-293. Fandiño, Y. (2013). Knowledge base and EFL teacher education programs: a Colombian perspective. Íkala, revista de lenguaje y cultura, 18(1), 83-95. Feiman-Nemser, S., & Floden, R. E. (1986). The cultures of teaching. In: M. C. Wittrock (Ed. ), Handbook of research on teaching (pp. 505–526). New York: Macmillan. Fennema, E., & Franke, M. L. (1992). Teachers' knowledge and its impact. In D. A. Grouws (Ed. ), Handbook of research on mathematics teaching and learning (pp. 147- 164). New York: Macmillan. Fisher, R. L. (2009). Who is a teacher educator? In C. L. Klecka, S. J. Odell, W. R. Houston, & R. H. McBee (Eds. ), Visions for teacher educators: Perspectives on the Association of Teacher Educator's standards (pp. 29-44). Lanham, MD: Rowan & Littlefield Publishers, Inc.
Flynn, K., & Gulikers, G. (2001). Issues in hiring NNES professionals to teach ESL. CATESOL Journal, 13(1), 151-160. Freeman, D., & Johnson, K. (1998). Reconceptualizing the knowledge-base of language teacher education. 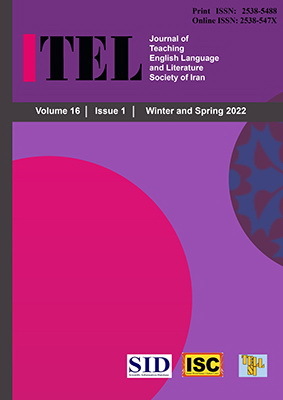 TESOL Quarterly, 32, 397–417. Freeman, D., Orzulak, M. M., & Morrissey, G. (2009). Assessment in second language teacher education. In A. Burns & J. C. Richards (Eds. ), Second language teacher education (pp. 77-90). New York, NY: Cambridge University Press. Golombek, P. R. (1998). A study of language teachers' personal practical knowledge. TESOL Quarterly, 32(2), 447–464. Graves, K. (2008). The language curriculum: A social contextual perspective. Language Teaching, 41(2), 149-183. Hannes, K., & Macaitis, K. (2012). A move to more systematic and transparent approaches in qualitative evidence synthesis: update on a review of published papers. Qual Res, 12(4), 402–442. John, P. D. (2002). The teacher educator's experience: Case studies of practical professional knowledge. Teaching and Teacher education, 18, 323-341. Johnson, K. (1999). Understanding language teaching. Canada: Heinle & Heinle Publishers. Jones, P. T., & Chen, H. (2012). Teachers' knowledge about language: Issues of pedagogy and expertise. Australian Journal of Language and Literacy, 35(2), 147-168. Kastner M, Tricco A., Soobiah C., Lillie, E., Perrier, L., Horsley, T., Welch, V., & Cogo, E., Antony, J., & Straus, S. (2012). What is the most appropriate knowledge synthesis method to conduct a review? Protocol for a scoping review. BMC Med Res Methodol, 12, 114-10.1186/1471-2288-12-114. Khani, R., & Hajizadeh, A. (2016). The construct definition of an English language teachers' content knowledge. The Qualitative Report, 21(5), 972. Kumaravadivelu, B. (2006). Understanding Language Teaching: From Method to Postmethod. ESL Applied Linguistics Professional Series, 8, 277. Lafayette, R. C. (1993). Subject-matter content: What every foreign language teacher needs to know. In G. Guntermann (Ed. ), Developing language teachers for a changing world (pp. 125-157). Lincolnwood, IL: National Textbook. Lagemann, E.C. (2002). An elusive science: the troubling history of education research, in Sandoval, W.A. and Bell, P. (Eds. ), Design-based Research Methods for Studying Learning in Context: Introduction, University of Chicago Press, Chicago, IL. Lefstein, A. (2009). Rhetorical grammar and the grammar of schooling: Teaching 'powerful verbs' in the English National Literacy Strategy. Linguistics and Education, 20, 378–400. Loewenberg Ball, D., Thames, M. H., & Phelps, G. (2008). Content knowledge for teaching: What makes it special? Journal of Teacher Education. 59(5), 389-407. Loveless, A. (2002). Literature Review in Creativity, New Technologies and Learning. A NESTA Futurelab Research report. Mackey, W. F. (1950). The meaning of method. English language teaching, 5, 4-10. Mann, S. (2005). The language teacher’s development. Language Teaching, 38(3), 103–18. Marks, R. (1990) Pedagogical content knowledge: from a mathematical case to a modified conception, Journal of Teacher Education, 41, 3-11. Mcewan, H., & Bull, B. (1991). The pedagogic nature of subject matter knowledge, American Educational Research Journal, 28, 316-334. Mcnamara, D. (1991) Subject knowledge and its application: problems and possibilities for teacher educators, Journal of Education for Teaching, 17, 113-128. Meijer P., Verloop, N., & Beijard, D. (2001). Similarities and differences in teachers' practical knowledge about teaching reading comprehension. Journal of Educational Research, 94(3), 171 184. Murray, J., & Male, T. (2005). Becoming a teacher educator: Evidence from the field. Teaching and Teacher Education, 21, 125-142. Myhill, D. (2005). Ways of knowing: writing with grammar in mind. English Teaching: Practice and Critique, 4(3), 77–96. Myhill, D. (2011). Grammar for designers: How grammar supports the development of writing. In Ellis, S., McCartney, E. & Bourne, J. (Eds) Insight and Impact: Applied Linguistics and the Primary School (pp. 81–92). Cambridge: Cambridge University Press. Noblit, G. W. & Hare, R. D. (1988). Meta-Ethnography: Synthesizing Qualitative Studies. London: Sage. Office for Standards in Education. (1993a). Curriculum Organization and Classroom Practice in Primary Schools. A Follow-up Report, (London, Department for Education). Office for Standers in Education. (1993b). Primary Matters: a discussion on teaching and learning in primary schools (London, Department for Education). Pineda, C., & Núñez, A. (2001). Getting in touch with reality: An English curriculum to boost students’ critical thinking skills and interest in global issues. HOW, A Colombian Journal for Teachers of English, 9, 34-39. Reagan, T., & Osborn, T. A. (2002). The Foreign Language Educator in Society: Toward a Critical Pedagogy. Mahwah, NJ: Lawrence Erlbaum. Richards, J. C. (1991). Content knowledge and instructional practice in second language teacher education. In J. E. Alatis (Ed.). Georgetown university roundtable on languages and linguistics 1991: Linguistics and language pedagogy (pp. 76-99). Washington, D.C.: Georgetown University Press. Richards, J. C. (1998). Beyond training: Perspectives on language teacher education. New York: Cambridge University Press. Richards, J. C. (2008). Second language teacher education today. RELC Journal, 39(2): 158–77. Richards, J. C., & Rodgers, T. (2001). Approaches and methods in language teaching (2nd Ed.). Cambridge, England: Cambridge University Press. Roberts, J, (1998). Language teacher education. New York, NY: Arnold. Russel, T., & Korthagen. F. (Eds). (1995). Teachers who teach teachers: Reflections on teacher education. London, UK: Falmer Press. Sampson M., McGowan J., Cogo E., Grimshaw J., Moher D., Lefebvre C. (2009). An evidence-based practice guideline for the peer review of electronic search strategies. J Clin Epidemiol, 62(9), 944–952. Sandelowski, M., & Barroso, J. (2003). Focus on research methods toward a metasynthesis of qualitative findings on motherhood in HIV-positive women. Research in Nursing and Health, 26(2), 153-170. Sandelowski, M., & Barrosso, I. (2007). Handbook of Synthesizing Qualitative Research. New York. Springer Publishing Company. Shaw, R. L. (2004). Finding qualitative research: an evaluation of search strategies. BMC Medical Research Methodology, 4 (5). Shulman, L. S. (1986). Those who understand: knowledge growth in teaching, Educational Researcher, 15, 4-14. Shulman, L. S. (1987). Knowledge and teaching: foundations of the new reform, Harvard Educational Review, 57, 1-22. Stones, E. (1992). Quality teaching: A sample of cases. London & New York: Routledge. Toye F, Seers K, Allcock N, Briggs M, Carr, E., Barker K. (2014). Meta-ethnography 25 years on: challenges and insights for synthesising a large number of qualitative studies. BMC Med Res Methodol, 14(80). Tsui, A. B. M. (2003). Understanding expertise in teaching. Cambridge: Cambridge University Press. Turner-Bisset, R. (1999). The knowledge bases of the expert teacher British Educational Research Journal, 25, 39–55. Turner-Bisset, R. (2001). Expert teaching: Knowledge and pedagogy to lead the profession. London: David Fulton Publishers. Velez-Rendom, B. (2002). Second language teacher education. Mahwah, NJ: Lawrence Erlbaum Associates, Inc.
Volmink, J., Smith, H., Munro, S., Lewin, S., Engel, M., & Fretheim, A. (2008). Conducting a meta-ethnography of qualitative literature: Lessons learnt. BMC Medical Research Methodology, 8(21). Wallace, M. (1991). Training foreign language teachers. Cambridge: Cambridge University Press. Wichadee, S. (2011). Professional development: A path to success for EFL teachers. Contemporary Issues in Education Research, 4(5), 13-21. Widdowson, H. (2002). Language teaching: defining the subject. In H. Trappes-Lomax & G. Ferguson (Eds.). Language in language teacher education (pp. 66-81). Philadelphia, PA: John Benjamins. Wilson, S. M. (2006). Finding a canon and core: Meditations on the preparation of teacher educator-researchers. Journal of Teacher Education, 57, 315-325.